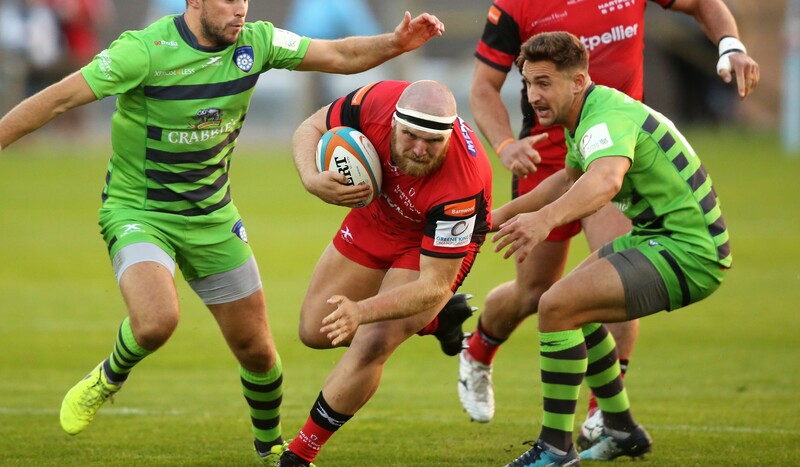 Hartpury collected an important and morale-boosting win as they opened their second Greene King IPA Championship campaign at the Gillman’s Ground on Friday evening, beating traditional big-hitters at this level, Yorkshire Carnegie. Eleven points from the boot of returning fly-half, Luke Cozens, was the difference between the teams on the scoreboard, a conversion and three well-struck penalties ensuring that the Yorkshiremen left with nothing. However, it was a tremendous defensive effort and a new-found composure, something that the team occasionally lacked last season, which laid the foundations for this result, in perfect conditions and on a carpet of a pitch. Hartpury had competitive debutants in the form of new club captain, Simon Linsell, and experienced scrum-half Richard Bolt. They were joined by former Rotherham Titans pair, Ben Foley and Jake Henry, who both arrived in the summer. Gloucester duo, Alex Craig and Will Safe, former Hartpury students, were also named, the latter on the bench. The game started at a brisk pace and the game was just three minutes old when Hartpury collected their first points of the season. Centre, Luke Eves, got hands on a loose Carnegie pass in midfield and made good ground into the visiting 22. He was eventually hauled down, but the quickly recycled ball was moved infield to where flanker Mat Gilbert had run a great support line to blow a hole in the Carnegie cover. The try was the start of an excellent performance from Gilbert, who missed all of the second half of last season through injury. He was able to show Hartpury what they had been missing, winning a string of turnovers and thundering into the tackle. Play continued to be lively, although mistakes from both sides undermined any attempt to apply pressure. Carnegie, not quite clicking with the ball in hand, seemed happy to send kicks deep, but found the Hartpury back three comfortable under the high ball and prepared to run it back. At least Hartpury had the boot of Cozens, who added a further three points shortly before the half hour, as Carnegie gave up a penalty as the Red & Blacks attacked. By contrast, moments later, Brendan Cope sent what seemed a relatively simple opportunity against a post, after Hartpury had needlessly transgressed at the breakdown. The hosts lost number 8, Iain Grieve, to a yellow card shortly before the break – hands in the ruck – but there was no sign of any imbalance as they started the second period with plenty of zip. Eventually Carnegie were penalised again, and Cozens stepped up to make it 13-0. The Yorkshiremen then roused themselves for their best period of the game, with their scrum proving to be a potent weapon. On more than one occasion they had the home team back-pedalling, winning a turnover into the bargain. The platform was sufficiently strong for them to eventually work winger, Dan Moor, into the left-hand corner for a relatively simple finish. 13-7 might have set alarms bells ringing in Hartpury minds, but Cope was again wide with the kick, pushing his effort beyond the right hand upright. Hartpury needed something and it came from the pack. As if to reassert themselves, they got a good nudge to take a Carnegie scrum against the head, before replacement Will Safe launched himself from the base. He burst through tackles to make tremendous ground up the middle of the pitch, picking up 35 metres and, more importantly, getting his team back onto the front foot. Lifted, Hartpury pressed again. Skipper Linsell, leading by example, drove deep towards the Carnegie line, before the ball was moved left for Eves to dive over in the corner. Referee Andrew Jackson had seen a knock-on in the build-up but, prior to that, he had also witnessed a Carnegie infringement. Cozens collected a further three points, for a semblance of comfort at 16-5. This was exactly the type of game that Hartpury might have let slip last season but the indications are that, on this performance at least, they now have the mentality to hold on. They played out the remaining minutes, largely in the Yorkshire half and largely without alarm, for a deserved victory. It was great to have Mat Gilbert back after so long out. His turnovers and tackling troubled Carnegie all night long.